This pretty Mothers day card is perfect for you to send your love on Mothering Sunday. 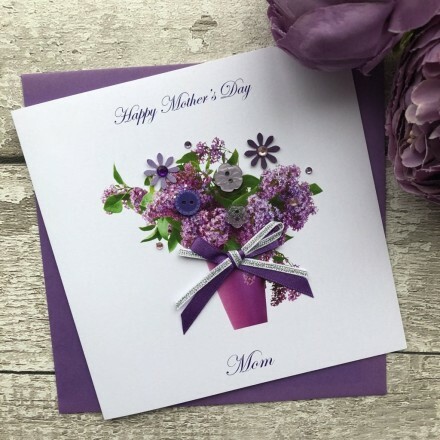 An eye catching design features an image of lilac flowers in a purple vase, the design shows flowers that have been embellished with jewels, flowers, buttons and finally this card is finished with hand tied with purple and silver ribbons. A personalised mothers day card is quite special to receive, a gift in itself.